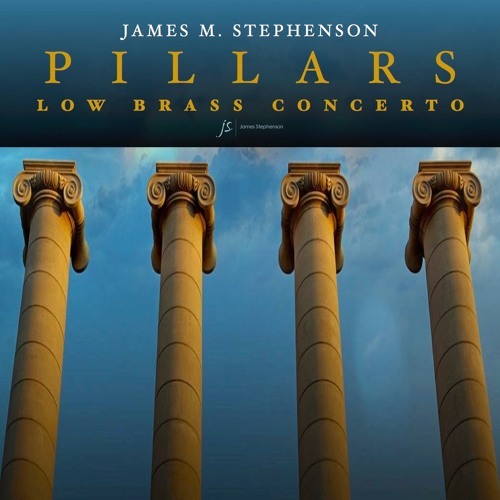 View score: https://issuu.com/stephensonmusic/docs/pillars_-_score_final WORLD PREMIERE by the Minnesota Orchestra, conducted by Osmo Vänskä SOLOISTS: R. Douglas Wright, Kari Sundstrum (tenor trombones), Andrew Chappell (bass trombone), Steven Campbell (tuba) Program Notes (by the composer): The story: A couple of years before composing "pillars", I was contacted by some good friends of Bill Zehfuss, the former principal trombonist of the Charleston Symphony, who had died the just the previous summer. They truly wanted to have a piece composed in his memory, and wanted to explore possibilities as to how to make that happen. I knew Bill from my performing days many years ago, as well as having worked with him when conducting the Charleston Symphony. As a matter of fact, the last time I had seen Bill was when conducting the brass quintet as soloists in front of the orchestra. Bill was the trombonist, and I recall having some great laughs with him late into the evening after our final performance. Wilson Ochoa successfully led a campaign, along with Michael Grose and Dan Satterwhite, to crowd-fund the creation of the piece. Once that was accomplished, we were honored to have the Minnesota Orchestra and conductor Osmo Vänskä (with whom I had worked previously) sign on to presenting the premiere, with their low brass section as soloists. The music: Basically - I tried to show off what trombones are good at. I knew I wanted to include some big/full section playing - and also some soft melodic chorale writing, urged by the principal trombonist and good friend, Doug Wright. Knowing some of the players personally, I also knew that I wanted spots where each soloist would get to show off. Sure - a few glisses here and there, and some technical stuff, but nothing too "crazy" hard (I don't think). The piece as a whole has a very "orchestral" sound. After the opening chorale, Interestingly enough, the first movement employs the four soloists in unison. I wanted to do exactly what an audience would NOT expect with four people out front, while revealing how beautiful that sound could be. Plus, I recalled from my trumpet playing days how fun/rewarding it is to be part of a group of multiple people playing, but to sound like one. The 2nd movement is where I remembered Bill. It is a (quasi) Passacaglia, with some aching lines, some literal orchestral "tears", and some grit, as I was remembering how sad/angry I was when I heard the news that Bill had died. The 3rd movement is more uplifting, and has a bit of a Latin feel, because the aforementioned last time I worked with Bill, when I was conducting, we did an all Latin concert. My last memory of Bill is hanging out at that Mexican restaurant afterward, and having a beer, celebrating and laughing with him. I wanted to reflect that in the music. There is also a "bluesy" section, which also employs some sleigh bells - a nod to Mahler's 4th symphony (one of my favorites) - which doesn't use the low brass, and would round out this concert featuring the "pillars" world premiere. The title: Bill was a very tall man. Probably 6'10" or so. Doug - principal trombonist of the Minnesota Orchestra - is also tall. Maybe about 6'4". So, with these two individuals being the crux of the creation of this piece, the image of pillars came into my mind. But, also, one might think of the low brass providing the strength to an orchestra, and therefore resembling the support such as pillars might provide. However, the most important reason for the title is due to the love and support showed by Bill's many friends. One definition of pillar is: "a person or thing regarded as reliably providing essential support for something." And that is exactly what all of these people did for Bill. So, in my mind, they are pillars of our world community, and I wanted to honor them, along with Bill, the soloists, and the orchestra, with my title.